The Hotel Izvir is situated next to the resort park with a unique spring of mineral water. There are few places that could boast as many natural mineral water springs as Radenci and the area around it. Over 45 springs have been documented. Archaeologists have found that the local mineral water springs were discovered and used even in prehistoric times. 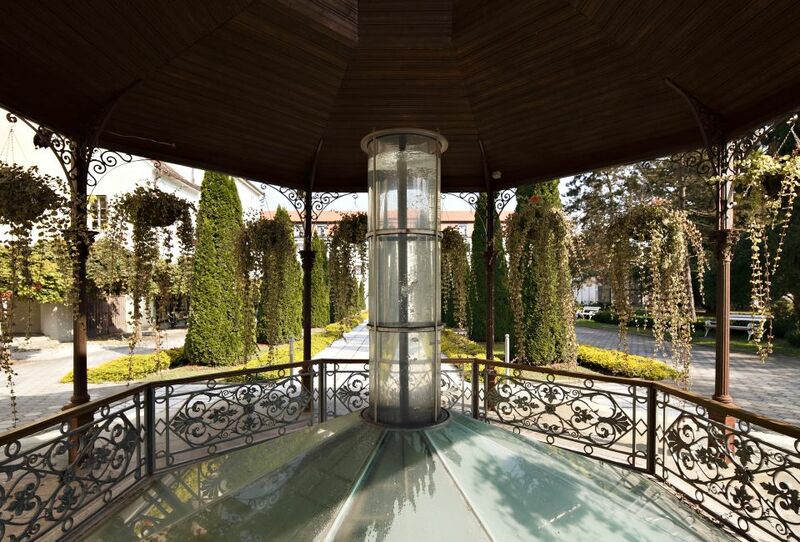 The Hotel Izvir was named in tribute to these wonderful gifts of nature (“izvir” means a spring in Slovenian). The hotel features rooms for health resort guests and other guests. It offers all the comforts of a health resort with direct access to the thermal world, the health centre and the wellness centre. A health resort hotel with 128 rooms, of which some are reserved for guests visiting for medical reasons. 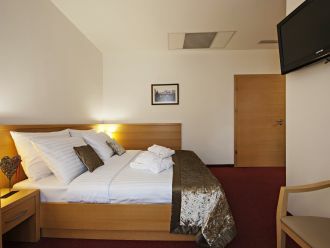 Six types of room are available, including rooms for the disabled. All rooms have air conditioning. Most rooms have a balcony. The hotel offers direct access to the thermal pools, buffet restaurant, health centre and wellness centre. 10 pools in the thermal world, connected to the hotel: 3 indoor thermal pools (33 °C, 2 whirlpools: 36 °C) and 1 indoor swimming pool (28-29 °C), 4 outdoor thermal pools (29-34 °C), indoor children’s pool (33 °C), outdoor children’s pool (29-30 °C) and an outdoor youth pool (28-29 °C). The pools are open all year round, except for the outdoor children’s and youth pools, which are open in the summer (1.6. to 31.8.). The world of thermal pools is open Sunday to Thursday from 7:00 to 21:00 and on Fridays and Saturdays from 7:00 to 22:00. The Pepsi buffet restaurant is situated next to the pools. Hotel guests enjoy free admission to all pools. Full-board and half-board meals are available in the Radin buffet restaurant (breakfast from 7:00 to 10:00, lunch from 12:00 to 14:00, dinner from 18:00 to 21:00). The hotel also houses the Izvir Café (8:00 to 20:00), while the Park Restaurant is situated in the resort park (Tuesday to Sunday from 10:00 to 17:00). In the Hotel Radin, guests will find the Swing Café (Fridays and Saturdays from 20:00 to 24:00, closed from June to August) and the Stil Aperitif Bar (7:00 to 23:00). The Vital Bar (Sunday to Thursday from 7:00 to 21:00, Fridays and Saturdays from 7:00 to 22:00) is situated at the entrance to the Thermal Park, while the Pepsi Restaurant (from 9:30 to 20:00) is inside the Thermal Park. Hotel guests can use the world of saunas (6 saunas and a Kneipp pool) free of charge every day until 16:00. The saunas are open in the summer (1.6. to 30.9.) Sunday to Thursday from 12:00 to 21:00 and on Fridays and Saturdays from 12:00 to 22:00. In the winter (1.10. to 31.5. ), they are open Monday to Thursday from 12:00 to 21:00, on Fridays and Saturdays from 10:00 to 22:00 and on Sundays from 10:00 to 21:00. The Corrium Medico-Wellness Centre also offers baths, massage therapies and a full range of wellness treatments. Zdravilišče Radenci is located near Gornja Radgona, near the Austrian border in the northeast of Slovenia and close to the motorway. Arriving on the A5 Pomurje motorway (Maribor–Dolga vas), take the Sveti Jurij ob Ščavnici exit. At the junction, turn left towards Radenci. The road leads through Kapelske gorice to the roundabout in Radenci. At the roundabout, take the second exit, which will take you into the Hotel Radin parking area on the left. It is 165 km to Ljubljana, 265 km to Trieste, 415 km to Venice, 485 km to Munich, 665 km to Milan, 255 km to Klagenfurt, 355 km to Salzburg, 220 km to Vienna, 305 km to Budapest, 135 km to Zagreb and 525 km to Belgrade. The bus stop is 500 m away and it is 7 km to the railway station. Maribor Airport is 50 km away. We accept the following credit cards: MasterCard, American Express, Visa, Maestro, BA. Bike rental, including electric bikes! 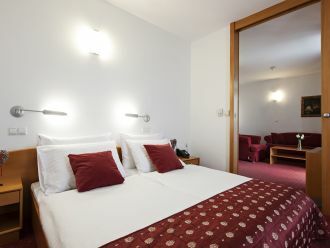 Comfortable double room with a 180 cm wide bed or two separate 90 cm wide beds with a view of the Mura River. The room (22 m2) features a bathroom with bathtub, shower and toilet as well as desk. A comfortable 16,4 m2 room with king size bed (140x200 -160x200 cm) and ensuite bathroom with shower or bathtub. 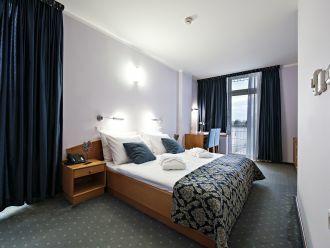 Comfortable double room with a 180 cm wide bed and a view of the park. The room (28.80 m2) features a bathroom with shower and toilet as well as a desk. We were there on the winter and we have a great time. Rooms are clean but not big, SPA & pools are great, especially external pool. Specially experience is to take a special bath in carbonated bath. There is no wifi in the rooms and in the restaurant just in the hotels lobby. Food is absolutely great. This hotel is for people which dose not ask for some other activities because beside hotel there is nothing special to saw in the city. But it is about an our to Graz in Austria so you can go there for the one day visit. We will back there surely. We went to Radenci Spa and Hotel Radin to spend a long weekend there. The receptionists are very nice, trying to help you as much as they can. The room we had was an economy double room, it didn't have the balcony, but that is reasonable, taking the economy class. We had the AC, which was perfectly OK. The room was clean, bathroom is also big enough. The food was very good and tasty, there is a big selection of everything. The menus are built by the nutritionists. The spa area is big and clean, It offers a 25 meters swimming pool and an area where you can soak in. Saunas are also a part of the spa area. You get free access to all the areas with the hotel card (but saunas are free only until 16:00). There is also a nice big park just by the hotel, where you can go for a walk. The WiFi signal is in the hotel lobby only. One of the things to try is to drink the mineral water in the hotel saloon, which comes directly from the underground thermal spring. The whole resort is located in a beautiful piece of Slovenia - where we will surely return! Nice cosy quiet place. A lot of things to do. Especially hiking, tennis and swimming. Zdravilišče Radenci – the heart says yes! A century and a half of health resort tradition and experience in treating heart diseases, a wealth of thermal pools and legendary mineral water – these are just a few good reasons why a holiday at Zdravilišče Radenci will make your heart sing! In the bathtub, the mineral water is absorbed through the skin, expands the blood vessels and makes the vascular walls softer and more flexible. Even ...a short, 15 minute bath will help regulate blood pressure, resulting in an immediate boost of well-being, while also benefiting the heart, skin and general well-being. Guests can drink the mineral water straight from the spring! It helps with low blood pressure and chronic constipation and prevents urinary calculi an ...d osteoporosis. Our physicians recommend a glass of natural mineral water before meals at last three times a day. Take advantage of this invaluable opportunity to detoxify and regenerate! The world of pools filled with the thermal water comprises ten indoor and outdoor pools with countless underwater massage jets and waterfalls. Between ... the indoor pools you will find a strong swim current, while there is a bridge with views of the Thermal Park above them. The swimming pool filled with plain water is ideal for the healthiest physical activity – swimming – or you can take advantage of the Kneipp pool to strengthen your health. Children can choose from two children’s pools. The Zdravilišče Radenci Health Centre offers rehabilitation after myocardial infarctions and heart surgeries, as well as a restorative programme desig ...ned to reduce the likelihood of repeated problems or the deterioration of cardiovascular disease and improve the patient’s health. We also treat diabetes, other metabolic diseases and neurological disorders and operate programmes to combat physical and mental exhaustion. Guests with a physician’s referral are welcome! Take advantage of the famed mineral bath that is beneficial for the heart or the sauna world with as many as six saunas with themed sauna programmes, ...including sauna sessions with mineral water ice to strengthen your immune system. We also offer a range of massage therapies, fango wraps and beauty treatments. At the Radenci Health Resort, full-board and half-board meals are available in the hotel restaurant, but there are a number of other bars and restaura ...nts to choose from. Local dishes are served on a daily basis, but we also cater for guests with special dietary requirements and needs. Our chefs have teamed up with a renowned nutritionist to prepare the Make a Healthy Choice programme, which allows guests to choose their own dishes to help with their health problems. Radenci boasts over 250 days of sunshine a year, perfect for outdoor activities. These conditions are also perfect for winegrowing and the making of t ...he best Slovenian sparkling wine. Take a look at the bubbles in the nearby Radenci mineral water bottling plant or in the sparkling wines of the Radgona wine cellar. Guests also enjoy the Bubble Hunt game, which takes them on a tour of Radenci. The Radenci Health Resort has been successfully organising various congresses, symposia and receptions for decades. The hotel complex features 8 confe ...rence facilities. The special feature of the conference events at the Radenci Health Resort is the health resort environment that is well-received by numerous business guests. You can offer the beneficial effects of the famed thermal mineral water at your event as part of the additional health offer that is tailored to your needs by an experienced team and seamlessly incorporated into the business event programme.